CBD Oil Review rates Kure CBD with one star because it qualifies for the Mission Badge. Kure CBD was founded by a vape industry veteran whose personal experience with the healing effects of CBD prompted a segway into the hemp business. Kure CBD promises “world class products created by top notch scientists”. But we have to ask, who are these scientists? Kure CBD lacks an appropriate level of transparency by not posting laboratory results online and failing to disclose basic elements of their process. The discovery of undesirable, even toxic, ingredients in their product line makes us reticent to give them the go-ahead. 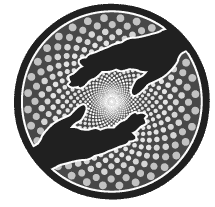 Founder Ido Lazarovich was desperate for solutions when his father was diagnosed with a serious illness which caused him to suffer from mood swings, insomnia, and chronic pain. Ido introduced CBD into his daily regimen and saw a significant improvement in his symptoms and quality of life. This experience inspired him to parlay his experience in the vape business into creating a CBD company. 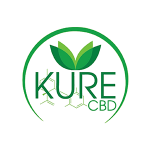 Kure CBD claims to use only non-GMO, pesticide-free, industrial hemp processed via CO2 extraction in their formulations. While they assert they scientifically test for safety and efficiency, these tests are not readily available online. We are not clear as to where geographically their hemp is sourced, nor their methodologies or processes. Calling Kure CBD’s product line expansive is an understatement; it borders on overwhelming. For starters, there’s the vegetarian capsules in both full spectrum and isolate options which we approve of. So far so good. Then there’s the skin line, a whopping 14-product category that contains highly questionable and a few downright unsafe ingredients. Nasty artificial colors like yellow #5 and blue #1 are lurking in products like the face cleanser. Canola oil and EDTA in the CBD Decolletage & Neck Cream do nothing to assuage our fears. And the pain relief salve may be the most dangerous of all, containing BHT, a preservative shown to have allergenic effects and even cause tumors in high doses among animals. The salve also includes IPBC, iodopropynyl butylcarbamate, a preservative with an even higher risk that is actively toxic by inhalation. Not cool and certainly not necessary. The products continue with 14 e-liquids that contain isolate and artificial flavors, a dead giveaway with names like “Sugar Rush” and “Sweet Tooth”. 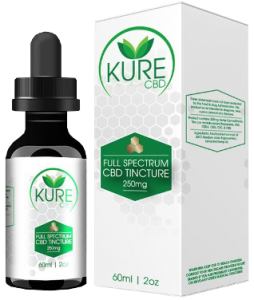 Kure CBD additionally offers tinctures with MCT oil, suppositories, oral sprays, and pet products featuring chewy treats made of quality ingredients. There are two main issues with Kure CBD: a lack of transparency and risky ingredients. Missing test results and details into their processes puts us on edge, and the toxic addition of IPBC in the skincare line upgrades that edge to high alert. 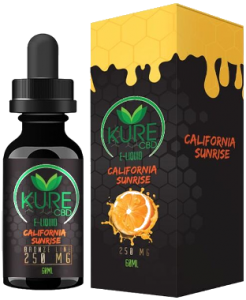 Bottom Line – Kure CBD exudes a familiar essence we’ve seen before, that of veteran vape business people who cash in on CBD without the real passion or commitment to natural living that should underpin a quality hemp purveyor. We unfortunately cannot recommend these products until we see more transparency from this brand. Kure CBD was founded based on the personal experience of its founder who sought to share the healing benefits of CBD with the world.